At The Dock at Linden Street, James Syhabout’s latest restaurant, everything tastes great with beer. The fennel and onion pedals are a show-stopping piece of fried decadence. Hours: Tue.-Sat. 5:30-9:30 p.m. Beer Shed, Mon.-Fri. 4:30-9:30 p.m., Sat.-Sun. 11:30 a.m.-9:30 p.m.
Of all the ways you can tell the story of Oakland's recent restaurant boom, this is my favorite: James Syhabout, a West Oakland native who spent his formative years hanging out at his mother's Thai hole-in-the-wall in uptown (before it became Uptown), traveled the globe and cooked at some of the world's best restaurants — El Bulli in Spain, The Fat Duck in Great Britain, and Manresa in Los Gatos. But when it came time to open his own place, Syhabout didn't think twice: He came home. These days, Syhabout joints — spread across The Town, in Piedmont, Rockridge, and Uptown (where he opened Hawker Fare, in his mom's old spot) — are some of the most highly regarded restaurants in Oakland. His newest project, The Dock at Linden Street, is located in a stretch of West Oakland that Syhabout calls the "new frontier." It's a part of the city that has few restaurants and retail businesses — mostly just warehouses, railroad tracks, and, off in the distance, the port. Located in a former loading dock adjacent to the Linden Street Brewery (whose owner, Adam Lamoreaux, is Syhabout's partner in the venture) that, happily, has a sizable parking lot, The Dock at Linden Street is split into two parts. The first, the Beer Shed, is more or less a literal shed, with communal high-top tables and a limited snack menu for people who want something to munch on with their beer. The restaurant portion, The Dock, is set in a rustic and warehouse-y space, high-ceilinged and rough around the edges. Syhabout said he drew inspiration from the nearby port, where shipping containers come in from as far away as Peru, Japan, and Australia. All of those countries have their own distinctive beer culture, Syhabout reasoned. And so the menu at The Dock functions as a kind of United Nations of beer bites, with influences that run the gamut from Korea to Scandinavia to a Midwestern country fair. As long as a dish tasted good with beer, and as long as Syhabout could give it a distinctive twist, anything was fair game. Not locked down by the constraints of any particular genre or culture, Syhabout and chef de cuisine Raiden Brenner are free to mix and match different culinary traditions — often to delicious effect. Most of the portioned-to-share menu items fall in the $10-$15 range, and many can be eaten with your hands. The food isn't as refined as what Syhabout serves at Commis, as boldly authentic as the Southeast Asian street food at Hawker Fare, or as luxuriously rich as the fat-drenched meat dishes at Box and Bells. But for pure fun and an off-the-chart deliciousness-to-price ratio, The Dock might just be my favorite Syhabout restaurant yet. Take the fried fennel and onion petals, a showstopping piece of fried decadence that combines the pleasures of a Bloomin' Onion with those offered by the dainty caviar toasts you might get at a fancy cocktail party. The beer-battered onion "petals" get dredged in rye flour and, after frying, are dusted with caraway salt, to approximate the flavor of pumpernickel. 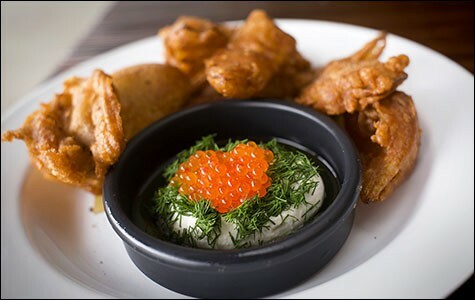 A dill sour cream dip studded with trout roe provided a refreshing, briny counterpoint, and was a subtle nod to Scandinavia. Linguica corn dogs further prove that Syhabout mixes "high" and "low" cuisines as well as just about any other chef in the game: Each hushpuppy-sized ball hid a juicy segment of the Portuguese sausage. On the side were two dipping sauces — a whole-grain honey mustard and a delicious lime-spiked crema — and a pile of the kind of pickled jalapeños and carrots served at taco trucks. Where else are you going to find a $10 plate of food that cohesively blends Portugal, Fruitvale, and the American heartland? Another highlight — a brilliant fish-sauce-and-lime-spiked kohlrabi and hearts of palm salad — pointed to Syhabout's Thai heritage. The best parts were crescent-shaped slices of fresh hearts of palm and fried pig ears, which offered a satisfying crunch. Perhaps the most whimsical item on the menu is something called a "falafel waffle," — chickpea falafel batter cooked in a waffle iron rather than a deep fryer. This was more brilliant in concept than execution, though: I loved the airiness of the waffle itself, but found the accompanying kefta-like lamb sausage too dry. A handful of more straightforward dishes were no less impressive. Off the Plancha was exactly the kind of grilled shrimp dish you might find at a cozy tapas bar in Spain — simply seasoned, impeccably fresh head-on Gulf shrimp served with an addictive Romesco sauce that was thickened with not-quite-ground almonds and infused with the heady ocean funk of anchovies. And a bowl of Korean-inspired steamed clams, studded with thick bacon lardons and fresh kimchi, came in an insanely delicious shoyu broth. Spooned over white rice, this was comfort food at its finest. There were a few mild disappointments, however. "Caesar" popcorn (tossed with lemon, anchovy, and grana cheese to approximate the flavors of the salad) had a juicy brightness I loved, but the kernels were stale and under-popped. And the bottarga-dusted potato wedges, fried until their insides were fluffy like steak fries, were way too salty. While the rotating beer list, curated by Lamoreaux and Beer Shed manager Ray Hsieh (formerly of The Trappist), isn't as wide-ranging as, say, Hog's Apothecary's, it was loaded with food-friendly taps and had enough variety to keep our interest. Given the restaurant's globe-trotting ambitions, we were surprised to find that the dessert list was as American as apple pie — or strawberry-hibiscus pie with house-made "Kool Whip," anyway. But there aren't many finer ways to end an evening than to share a slice of that pie, or one of pastry chef Andrea Johnson's excellent soft-serve sundaes — maybe out on The Dock's outdoor patio, where, as Syhabout likes to say, you can enjoy one of the nicest sunset views in Oakland.